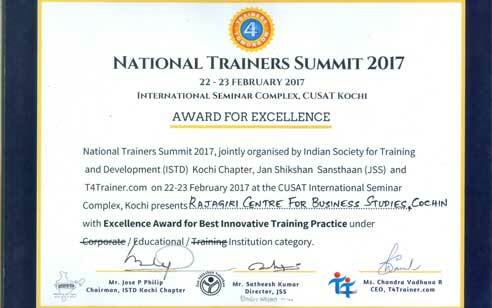 Rajagiri won the Excellence Award for Innovative Training Practices during National Trainers Summit 2017 held at CUSAT (Cochin University of Science and Technology) last day. 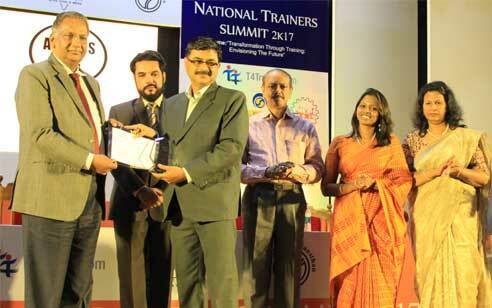 Summit was organized by Indian Society for Training and Development in association with Jan Shikshan Sansthaan and T4Trainer.com. Rajagiri College is known for utilizing all available resources and a combination of advanced and innovative Training techniques for the professional training especially for management students. The psychology lab coming up in the Hill campus is another endeavor in this direction. For the Department of Human Resource Management of Rajagiri College, which was among the pioneers of professional HR management education in India, the award comes as a recognition for its laudable contributions to management education, training and development.